Greig Laidlaw is confident he can spearhead Scotland's Six Nations revival after being handed the No.10 jersey for their clash with Wales in Cardiff on Sunday. The Edinburgh captain inherits the playmaker role from Dan Parks, who retired on Tuesday after missing out on selection for Cardiff, in a side showing two changes from the one which lost 13-6 to England last Saturday. Laidlaw won the first two of his three caps as a replacement scrum-half, before coming on at fly-half for Parks in the Calcutta Cup clash and an impressive display has been rewarded with his first Test start. "I thought it [his first Test start] would be as a nine, if I'm really honest, but I'm really looking forward to the challenge of playing stand-off," he told PA Sport "It's not so much of a surprise now because I've been playing so much as a stand-off for Edinburgh and I feel as though I've been doing well." 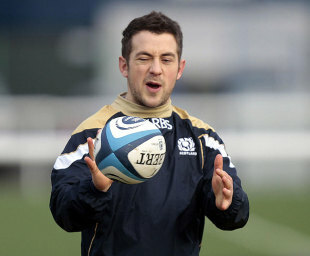 Laidlaw has repeatedly changed half-back roles for Edinburgh this season and maintains he still wishes to be considered for both positions. He recognises the challenge presented by the position and being the frontline goal kicker, a responsibility he has held for Edinburgh this season, and to spark Scotland's attacking play. But Scotland are capable of defying their underdog status and profligate start to the championship against England by beating World Cup semi-finalists Wales, according to Laidlaw. "It's a big challenge. They've got great players in their side and had a great win at the weekend," he said. "I also believe Scotland have got great players. I think it's now time for Scotland to put in a few big performances and hopefully I can be part of that." The only other change in the team announced yesterday was the inclusion of Geoff Cross, who has been named at tight-head prop in place of Euan Murray, who does not play on Sundays for religious reasons. Uncapped Glasgow Warriors trio Weir, Stuart Hogg and Ed Kalman were also called up to the bench. Teenager Hogg is also determined to make a lasting impression if handed his debut. "As a kid you dream of playing for Scotland and now I've got the opportunity," he said. "If I get on I'll grab it with both hands and hopefully do what I've been doing and really enjoy it." Scotland's training sessions this week have concentrated on making - and crucially taking - chances after the profligate showing against England. Hogg added: "We've worked a lot this week on two v ones and line breaks, what we do after. We've worked hard on that this week and at the weekend if it comes again we'll follow through and score some tries." Scotland head coach Andy Robinson remains certain Scotland are capable of delivering. "I have belief in our ability," he said. "It's being able to keep our heads, keep our composure. If we can do that we'll be able to take those opportunities. Whatever opportunities are there we've got to make sure we're able to take."